Most of us turn to bronzers when we want to add a bit of shimmer or illuminate parts of our skin. 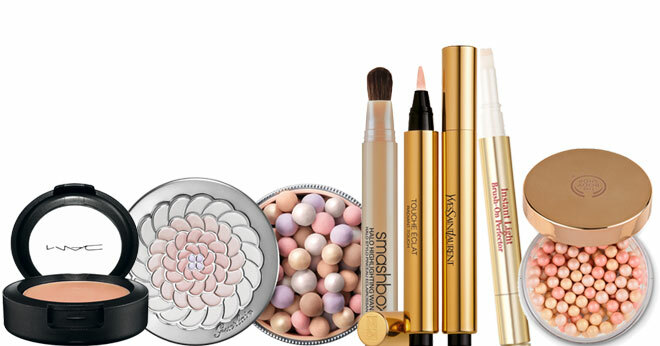 Though they work beautifully and are perfect for summer, not everyone can wear them (think those with very fair skin) and the bronze colour doesn’t always suit the rest of your make-up. Enter: highlighters and illuminators. A bit more obscure than bronzers, these magical products do exactly what their names suggest ­– they give the skin a shimmery glow, and allow you to highlight areas you want to draw attention to (think cheekbones, brow bones and the bridge of your nose). They come in many different shades, from ivory to darker shades of brown, so there’s a colour for every skin tone. They contain brightening / illuminating particles that “uplift” the skin and add that sought-after dewy glow. Available in liquid, powder and cream form, they’re ideal for sculpting and contouring and are perfect for adding glow to a dull complexion. I totally love highlighters & concealers for the mere fact that I have acne prone skin and can experience breakouts anytime of the month. Concealers have lately been a super favourite to always have in my bag and for those days when I just want to glow I would do some highlighting, and of course for a night out I love the look for bright glowing skin. I had tried THE BODY SHOP Brush On Radiance and I was super impressed. every girl needs a YSl Touche Eclat in her life! I love make-up and would love to try this as I am always trying to be tanned? I never really knew what the use for a highlighter is but after this great article im def gonna go buy me some! I never really know where or how to apply shimmers but with the comment below i will surely give it a shot! Never heard of these before. I will have to go and read up on it. Bronzing pearls are amazing! I love that they do not have a flat tone but offer dimensions of colours from the different pearls.